Brian Meader is a native of Concord, California and attended Concord High School. After graduating, he worked as a Computer Network Technician. Tired of sitting in front of a computer all day, Brian decided to take an EMT class. QA Manager and his current role of Operations Manager. Never one to shy away from hard work, he enjoys the variety of experiences he has gained working at Medic. Brian was honored for his outstanding service as Medic Ambulance’s Paramedic of the Year, Solano Division in 2010. 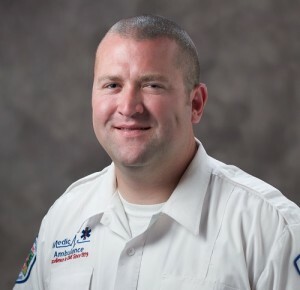 For the last two years, Brain has served as Operations Manager for Medic Ambulance. In 2013, Medic Ambulance was selected as Pilot site by California Emergency Medical Services Authority (EMSA) for the Community Paramedic Pilot Project. Today, Brian is being recognized for not only his work as one of the Community Paramedics, but also for his role as the lead site educator for Medic Ambulance Community Paramedic Pilot Program. The State of California EMS Agency as a 2015 EMS Innovator recognized Brian for his role in coordinating the local training for Paramedics in the pilot program. Community Paramedic is a new and innovative model in providing healthcare and Brian is one of only 77 community paramedics in California. Solano County is one of only 12 sites working under a groundbreaking pilot program sponsored by the California EMS Authority and the California Healthcare Foundation. Brian was also recognized as a 2016 California Star of Life in March by the California Ambulance Association in Sacramento, California. Great Job Brian!